The machine base is a tabletop design fitted with a laminated mica top on sturdy cast iron legs with steel pipes/angles providing the necessary support. The machine is fitted with a central housing that contains two separate shafts driven by the same motor – but both these shafts can be rotated in different directions with the help of an idler pulley. This pulley also helps in belt tightening. ¼ h.p. 1440 rpm single phase 220 volts motor is provided. The shafts are fitted with support washers for the grinding laps and also fixed with the base plates for grinding laps. The machine is fixed with coolant splash guards and a coolant re-circulation system. The machine is provided with a coolant tank, but the coolant pump should be arranged locally. The machine is provided with arm rests. The machine comes fixed with outlet trays for the coolant and lamps. The Gemstone is fixed on to a wooden Dopstick (not provided) with the help of the dopping wax.The stones is then operated upon the grinding laps fixed on the grinding lap bases to obtain the required shape and size of the stone manually. 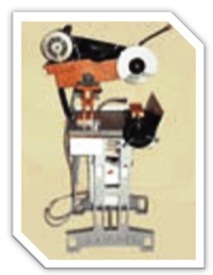 The motor helps in rotating the grinding laps only and all other operations are to be done by the operator manually. 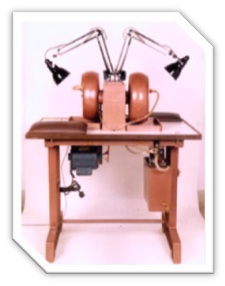 Its table-top designs increases efficiency as compared to the traditional hand operated floor type attachments. Two to Four Persons can operate with one motor in a very clean and modern way. The grinding lap, the polishing lap, dopsticks, and coolant attachments are not provided with the machine. Ideal equipment for controlling the weight of the pre-forms as compared to the complete machine made pre-forms. It is also useful for getting rid of impurities in certain areas of the stone more efficiently. Most suited for pre-forming high value rough stones.